In April 1942, intercepted signals alerted the US Navy that the Japanese would strike at Port Moresby in Papua and Tulagi in the southern Solomons about 3 May. Two US carrier task forces, built around the USS Yorktown and the USS Lexington, rendezvoused off Espiritu Santo on 1 May. While the Lexington refueled the Yorktown steamed towards Tulagi which the Japanese occupied on 3 May. The Yorktown was within range of Tulagi on the morning of 4 May and launched a strike that caught the Japanese by surprise and sunk some minesweepers and landing barges. The Yorktown quickly retired southwards to rejoin the Lexington at dawn on 5 May, 650 kilometers south of Tulagi. The previous day, the Lexington had been joined by Task Force 44 which included the heavy cruiser HMAS Australia and the light cruiser HMAS Hobart. 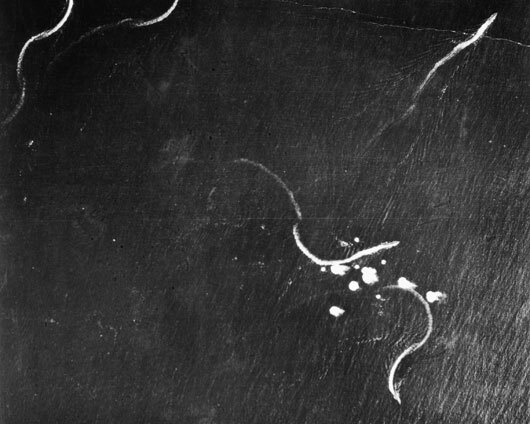 The Japanese Carrier Strike Force moved down the eastern flank of the Solomons on 5 May and throughout 6 May, neither force could locate the other. On 7 May, the two opposing carrier groups were 300 kilometers apart. The Japanese spotted an American oiler and destroyer and sank both ships. While the American carriers sought the enemy carriers, Task Force 44 was ordered to attack the convoy heading for Port Moresby. However, the Japanese became aware of Task Force 44 and ordered the invasion convoy to return to Rabaul. Task Force 44 was attacked by Japanese aircraft and then by American aircraft from Townsville without receiving a hit. About 11 am on 7 May the small Japanese carrier Shoho was sunk by US Navy aircraft. On 8 May, search aircraft from each carrier group detected each other at approximately the same time and launched strikes. 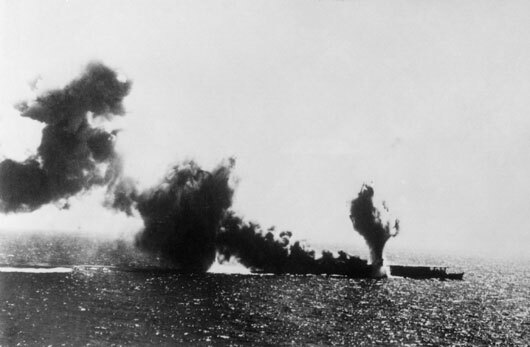 One of the two Japanese carriers was damaged. 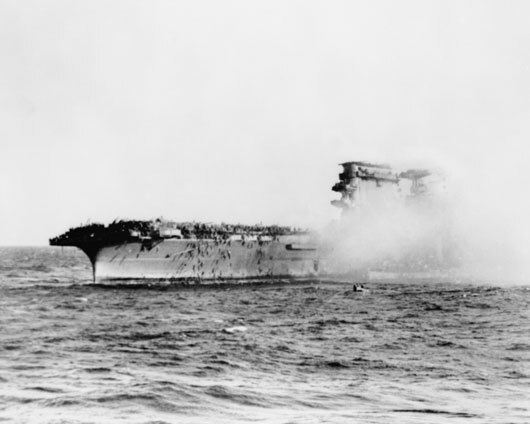 Both US carriers were hit, the Yorktown not seriously but the fires aboard the Lexington forced it to be abandoned and sunk. Although the Japanese lost less tonnage than the American ships, it was clearly an American-Australian victory with the Japanese attempt to invade Port Moresby from the sea being abandoned. Less than a month later, the Yorktown would be sunk but not before playing a vital part in the decisive battle of Midway when the Japanese lost the better part of their carrier fleet. 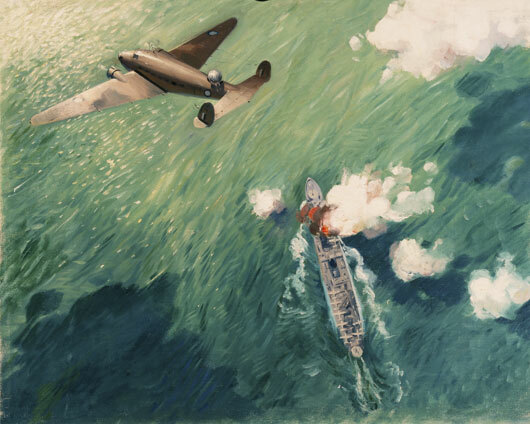 An artwork depicting a Lockheed Hudson of 6 Squadron RAAF scoring a direct hit on a Japanese seaplane tender south of New Britain (AWM ART25914). 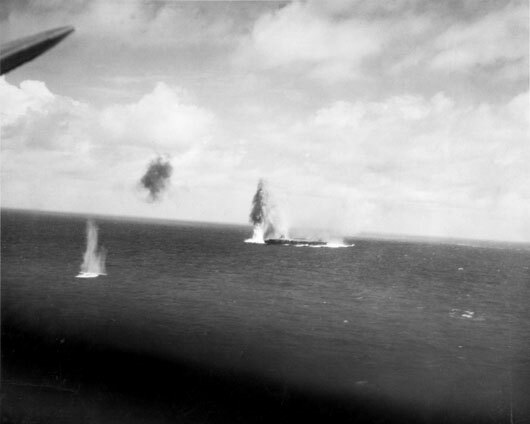 Japanese shipping taking evasive action while under attack by Allied air forces in the Battle of the Coral Sea (AWM 128127). The 30,000-ton Japanese aircraft carrier Shokaku under attack by American aircraft during the Battle of the Coral Sea (AWM 148953). The Japanese aircraft carrier Shoho under attack by US Navy aircraft in the Coral Sea (AWM 157892). US Navy aircraft carrier Lexington on fire as crewmembers abandon ship (AWM 157901).